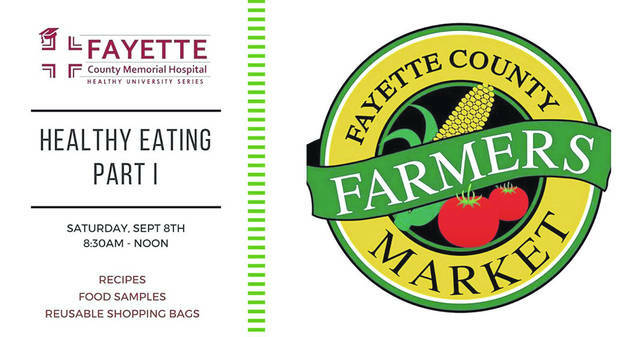 Fayette County Memorial Hospital (FCMH) partners with the Fayette County Farmers’ Market this Saturday. Stop by the FCMH booth to meet and talk to hospital staff and providers, and sample simple, healthy foods prepared by the FCMH chef, James Vasser. A healthier you and a healthier environment! Those interested may pick up recipe cards as well as reusable shopping bags (these bags will look great with the lovely Farm Market bags available for only $2 at the info booth) to shop for your weekly groceries, advertise the market and our hospital partner in healthy lifestyles, and make a statement about reducing plastic waste. The FCMH booth will have other surprises, including Tanger PinkStyle cards, which benefit the mammography program and raffle tickets. The market is open Saturday morning from 8:30 to noon and is located in the municipal parking lot on the corner of South Main and East East streets. SNAP EBT food benefit cards, Senior Farm Market coupons and credit/debit cards are accepted. Those using the SNAP EBT card for produce receive matching dollar “Produce Perks” tokens ($1 for $1) for additional fruits and vegetables. So,”buy one, get one” for fruit and vegetables, up to $20 EVERY market day. All first responders (police, EMTs and firefighters), teachers, medical providers and Farm Bureau members may pick up $5 coupons every week through the end of September and the close of the market. These coupons may be used to make farm market purchases anytime during the season. The following list contains the names and products of the vendors that expect to set up for the Saturday Market. Other vendors may participate as well. Persinger Cottage Foods (David Persinger and Julie Mosny): Jam Man: peach butter, jams, jellies (including peach butter, red raspberry jelly, a few NO added sugar varieties: triple berry, strawberry, blueberry, and black raspberry). Texas sheet cakes and oatmeal cake. Pie Lady: Assorted fruit pies, Buns Bars, cini mini’s, banana cake, pumpkin cookies, cinnamon rolls, pecan sticky buns, honey and comb honey. Wood Designed by DW (Debbie Welch): Wood crafts: decorative bird houses, wooden totes, patriotic & wooden Ohio signs, pigs, cows, chickens. Hand made crocheted dishtowels, clothes, potholders, pocket books and baby booties. Special orders welcome. Your Other Mother’s Kitchen (Don & Sara Creamer): Artisan breads, whole wheat brownie tarts, and bran muffin tops. By Thy Hand (Mark and Lori Chrisman): Angel food cakes, specialty breads, pies, cookies, dip mixes. Chilcote Farm (Bruce & Marlene Chilcote): Honey, brownies, sheet cake, cookies. Engedi (Beth Day, Alana Walters, Janet Bick): Assorted home baked goods (cinnamon rolls, bread, yeast rolls, cookies, pies, brownies, cobblers, whoopie pies, small specialty bread) and a special children’s activity. Greens & Greenery (Katrina Bush): Seasonal produce including lettuce, garlic, green beans, white and yellow potatoes, hot and sweet peppers, tomatillos, green onions, leeks, sweet potatoes. Dried herbs (basil, sage, catnip, sacred basil herbal tea). Buckeyes, fudge, and personal pumpkin pies. Cut flower bouquets. Perennial blooming flowering and aloe plants. Beeswax skin care products. Jones Farm Fresh Produce (Jon & Taylor Jones): Apples, squash, potatoes, onions, cucumbers, tomatoes, mums, pumpkins and gourds, chicken breast, chicken patties, chorizo chicken links, wings, sausage patties, bulk sausage, ground pork, eggs, hamburger patties and ground hamburger.